The River Club Golf Course in Pawleys Island is one of the most popular plantation-style courses in the Myrtle Beach area, offering golfers the opportunity to play world-class golf in a scenic Lowcountry setting. Built on a former rice plantation in Pawleys Island, about 20 miles south of Myrtle Beach, this Tom Jackson signature course is part of the prestigious Waccamaw Golf Trail. Featuring pristine wetlands, maritime forests and more than 100 sand traps and bunkers, the River Club is as difficult to play as it is beautiful to admire. The River Club received a 4.5-star rating by Golf Digest and was named one of its “Top Places to Play” in 2006. 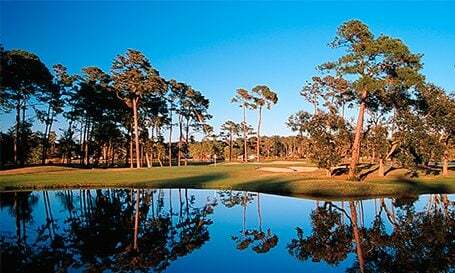 It is one of the top plantation layouts in the Southeast and remains a favorite among visitors and locals alike. Kids always play free per every paid adult at the River Club and discounts are available for those who purchase packages that include rounds at the nearby Litchfield Beach Country Club or Willbrook Plantation. Let our expert golf directors help plan your trip & get a free round. Book 2 rounds or more and save $5.00 off per round off for any times of day across 22 top rated courses. Also savings up to 30% off your accommodations. Book 2 rounds or more and save $5.00 off per round off for any times of day across 22 top rated courses. Book a minimum of 2 rounds on any Founders Group International golf club and receive a $50 ADIDAS Rewards Card. The ADIDAS Rewards card any be used on only ADIDAS merchandise at any FGI golf club. One $50 ADIDAS Rewards card per golfer. Our most popular option for booking and playing all area courses! Build your own custom, dream golf vacation! SAVE BIG with weekday and afternoon rates at Myrtle Beach's best courses! Special pricing on tee times for weekdays, Early AM tee times, PM tee times and special hot deal offerings on select courses. Also, enjoy up to 20% off your accommodations. Beautiful course and an amazing time to play with friends! Fun course and overall great shape. Plenty of water, so bring your A game! Really like the Par 3 over the water and the 18th par 5. The par five is a great risk reward finishing hole. Beautifully maintained course. Paired up with 2 locals who were very helpful in educating us about the "quirks" of the course. Enjoyable day. Had a wonderful time here. The course was in perfect condition and the greens were fast. I loved playing this course and would definitely go back. Everyone time I play this course it is a great experience. The 18th hole is one of the best risk reward holes in the area. A par 5 that most people can reach in two. First time playing here. My golfers always tell me how great it is so i had to see and they were correct.Condition of the course was great, All staff was friendly and very helpful. I will definitely send groups their way. Thank you River Club for a great first experience. Enjoyed our round at the River Club. Starter was personable and clubhouse staff were friendly. Had a junior golfer with me and he liked the course. Lots of water and bunkers but a fair course. Looking forward to playing again in a future beach trip.